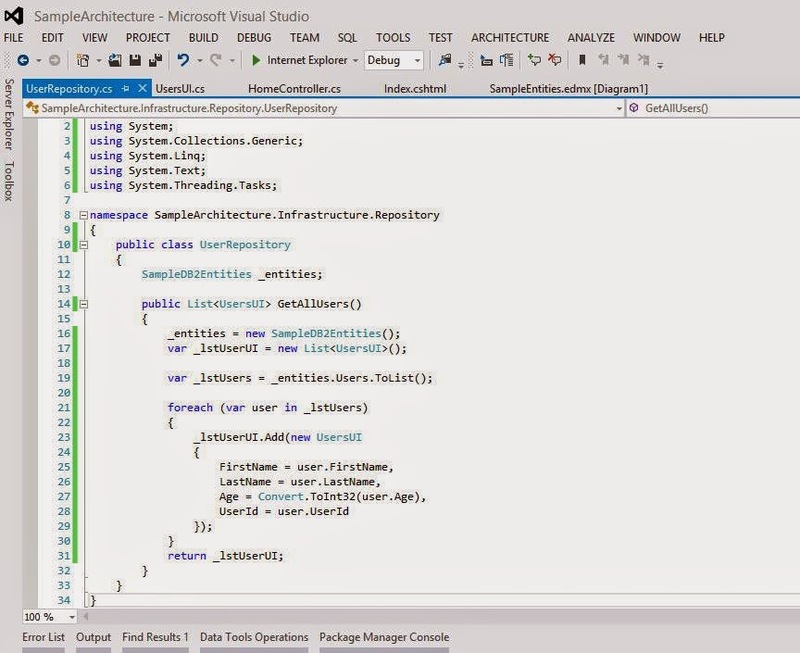 § An mvc application using Onion architecture. 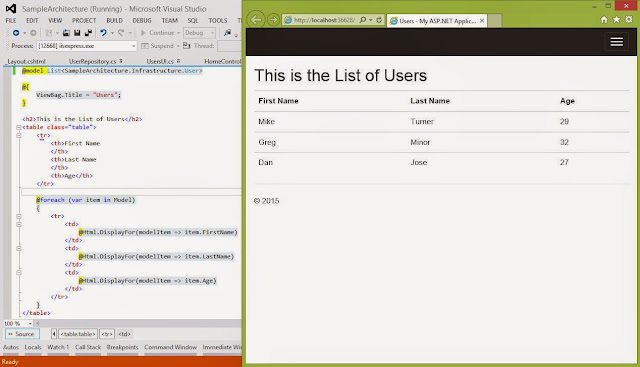 § Entity framework with database first approach. 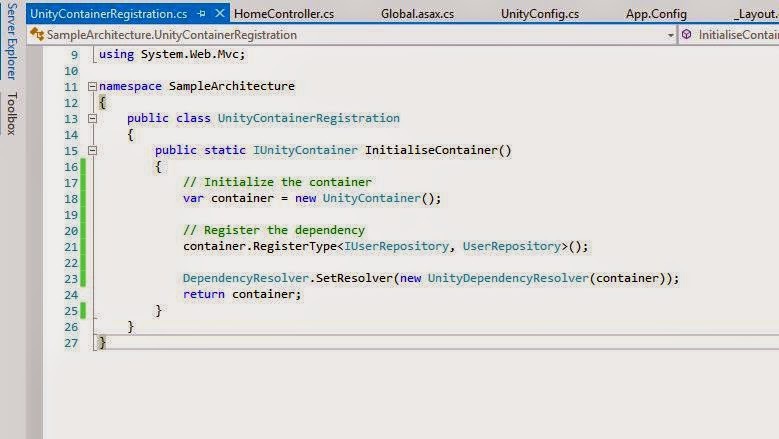 § Dependency injection using Unity container. 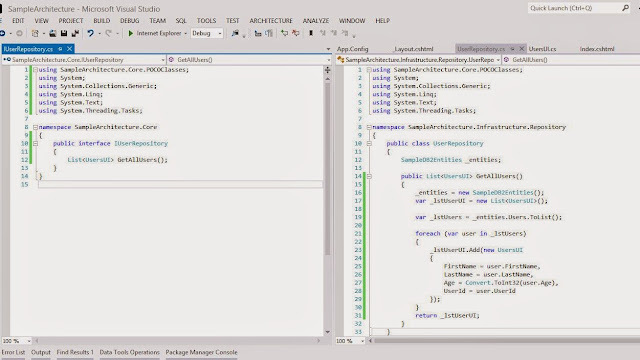 § Repository pattern with a repository per entity. So let's start with some of the basics. What is Onion architecture ? This architecture term was coined by Jeffrey Palermo back in 2008. Long time since then and it has become very popular these days. When you get into the details of this architecture, you might feel that you were already using from long time but may not be aware of that. Just a quick introduction to it. 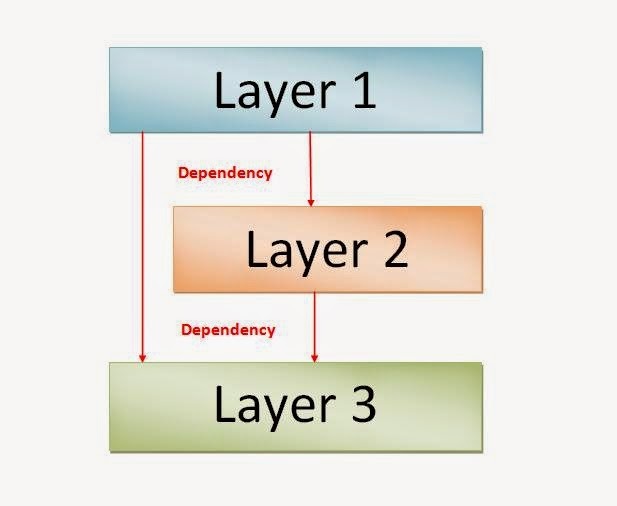 Onion architecture is the way of designing your application layers in such a way that, like an onion, the innermost layer or the core component, we can say, is independent of the layer above it. As we move away from the core, the layers/components can depend on the layer towards the core but not on the layers above itself. For example, if we have 3 layers of architecture, and Layer1 is the innermost or the core layer, then Layer2 and then Layer3. So, to create an onion architecture based application would have Layer1 as the innermost layer, independent of Layer2 and Layer3. Then Layer2 comes above Layer1 and depends on only Layer1 and NOT Layer3. Finally, Layer3 is the outermost layer and can depend on both Layer1 and Layer2. 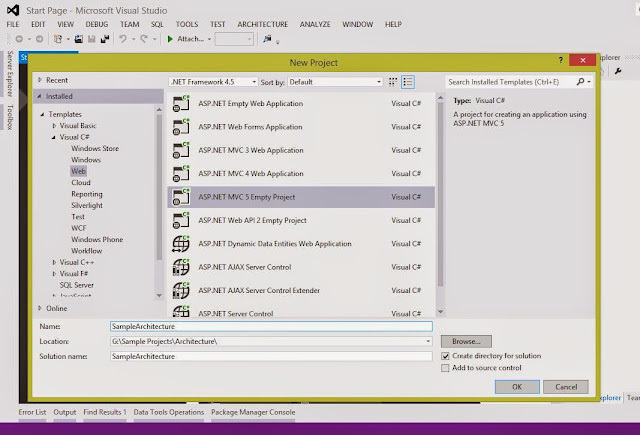 Let's try to understand by creating a new MVC application. We will create an application with tight coupling, and try to convert into Onion architecture with the system of loosely coupled components. 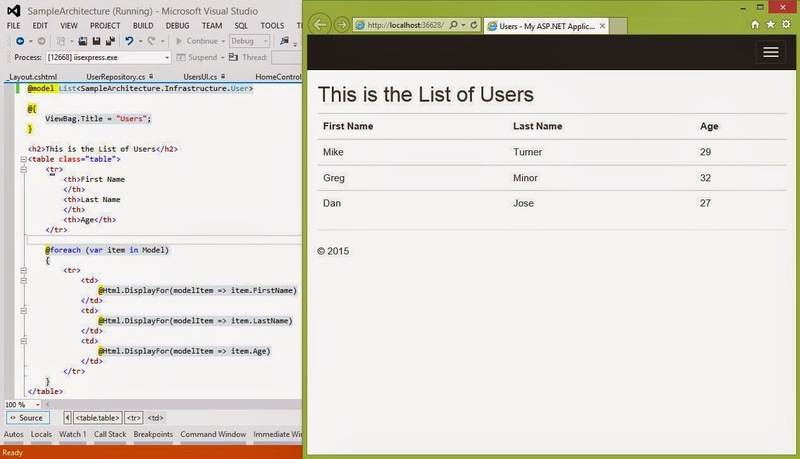 Fire up your visual studio and add a new project of type MVC. Now bind the Model in the View, run the application and see the results. Looks good so far. But there are few issues in this code. 1. 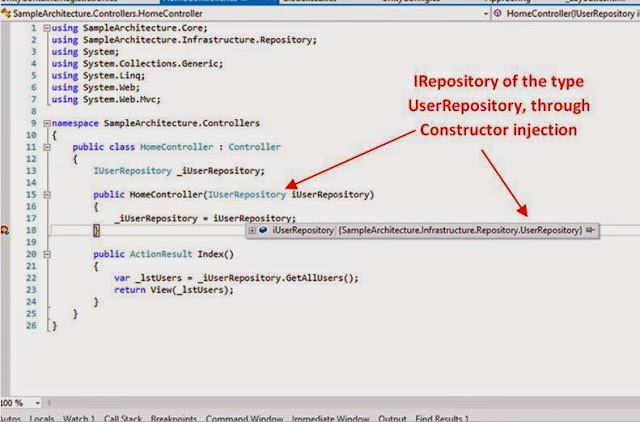 Violation of Single Responsibility Principle: The controller class is dependent on the concrete UserRepository class. The issue is that the Controller method is now responsible for multiple tasks, i.e. instantiating the repository and returning the view with the data. This violates the S of the SOLID principles, which says that each class/function should be responsible or only one task. 2. Tight coupling between the Web and the Infrastructure project: Our web project is directly dependent on the entities. 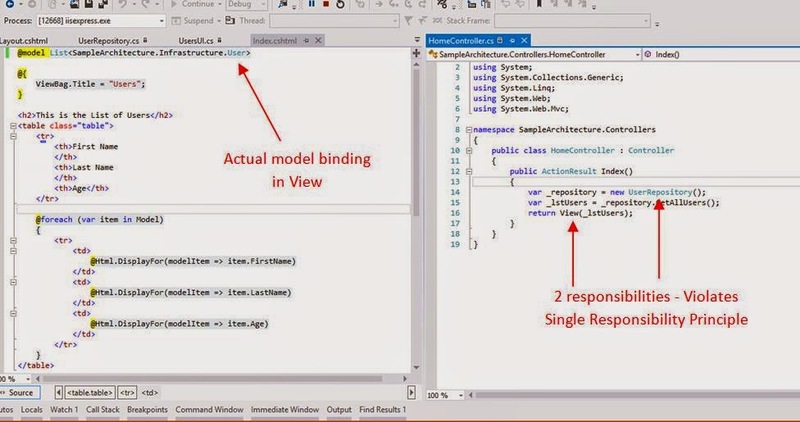 This includes not only the Controller class but also the View (as the View will use the Model property to bind the data). 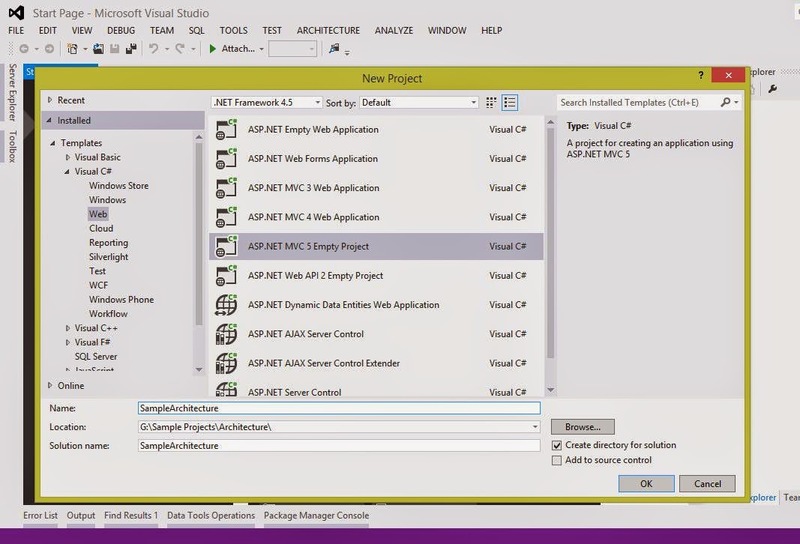 So in future, for some reason, we need to remove the use of entity framework, it will not only affect the Infrastructure project but also the web application as we directly refer the entities into the Controller and View. 3. 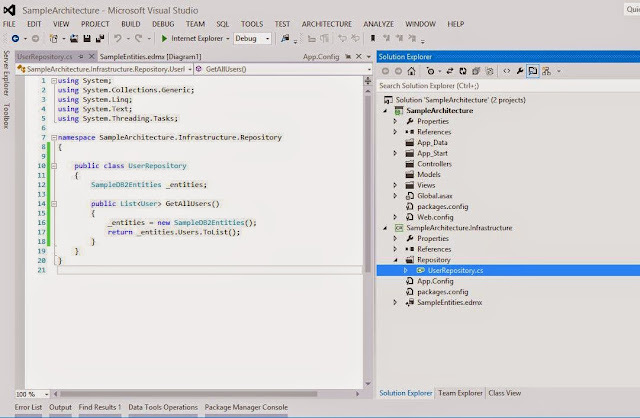 Concrete Repository class: UserRepository is concrete class in the project. As a result, where-ever, it will be used in the project, it will increase coupling between the components. 1. 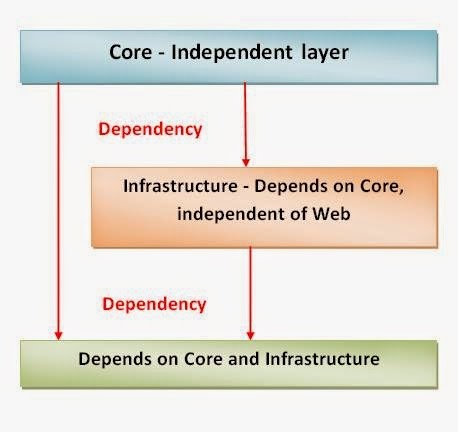 Core layer will be independent of the Infrastructure and Web layers. This becomes Layer1 of our earlier discussion. 2. 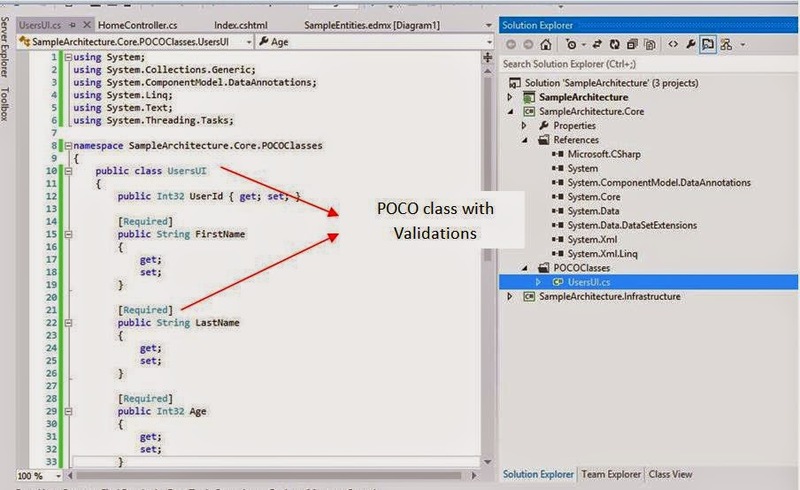 Infrastructure layer will be independent of the Web layer, but will be dependent on the Core layer, for the POCO classes. This becomes Layer2 of our earlier discussion. 3. 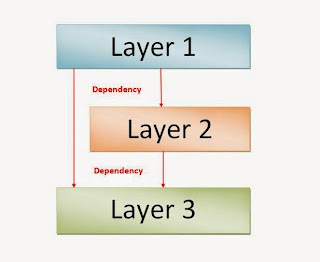 Web layer will be dependent on both the Core and the Infrastructure layers, for the use of POCO classes and the repository classes. This becomes Layer3 of our discussion earlier. 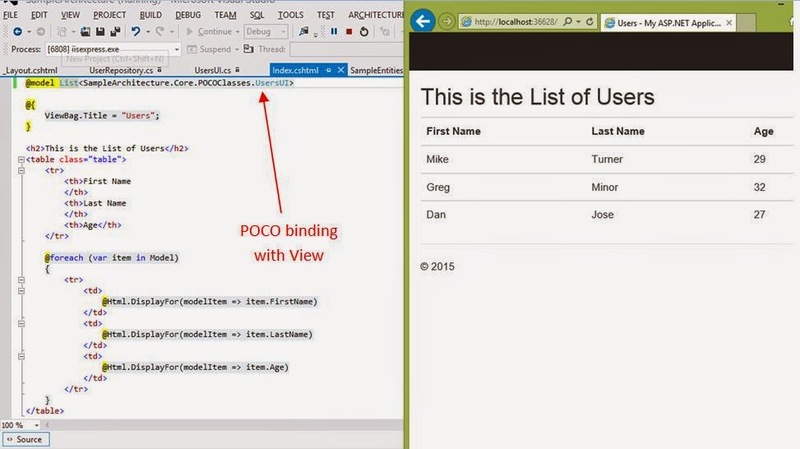 So let's add a new project of type ClassLibrary and add a POCO class called UserUI. 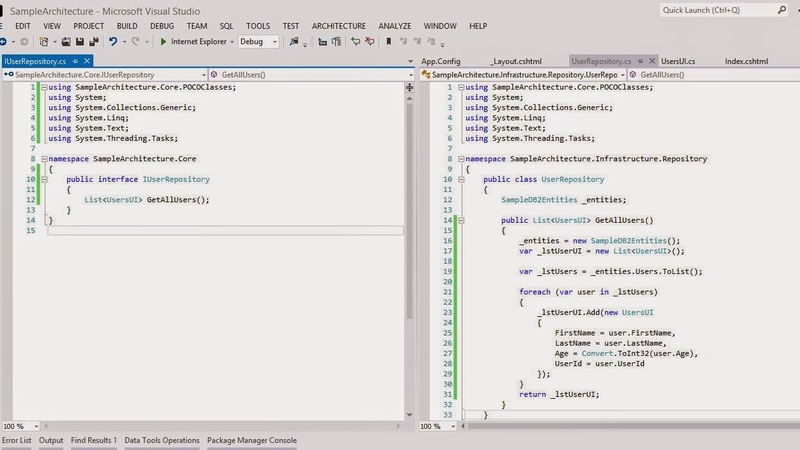 Another advantage of these classes is that we can add the validations of the model here itself. Next, we change the repository method to use the POCO class and return the same to the Controller and bind it with the View. Run the application and now you can see the results. So now even if you need to remove the entity framework, just need to make changes in the Infrastructure layer. 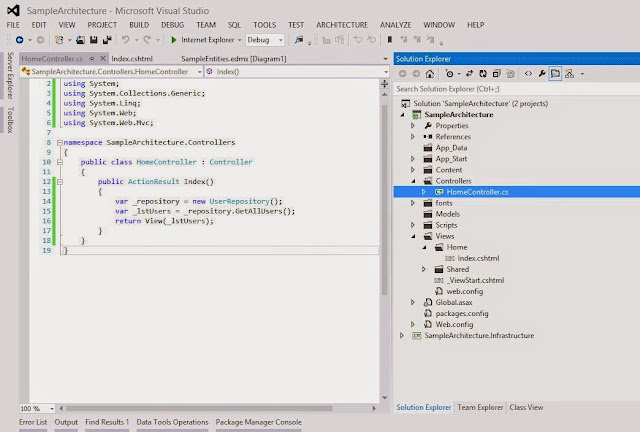 No need to change the Controller method or the View binding and hence no changes in the Core and Web layers. In order to use it, we need to add reference to the unity dll's using the nuget package manager. 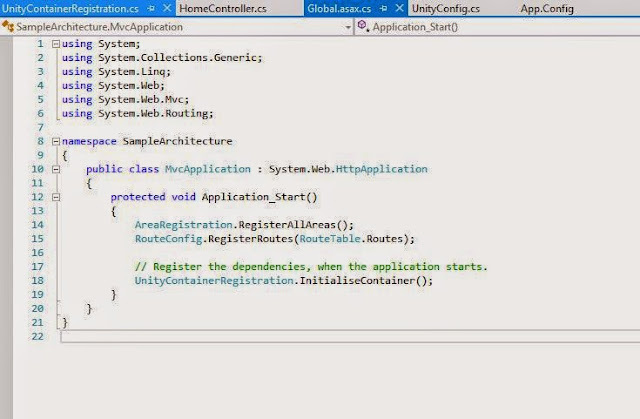 This is to be added in the Web project, as we need to inject the dependency on the controller methods. 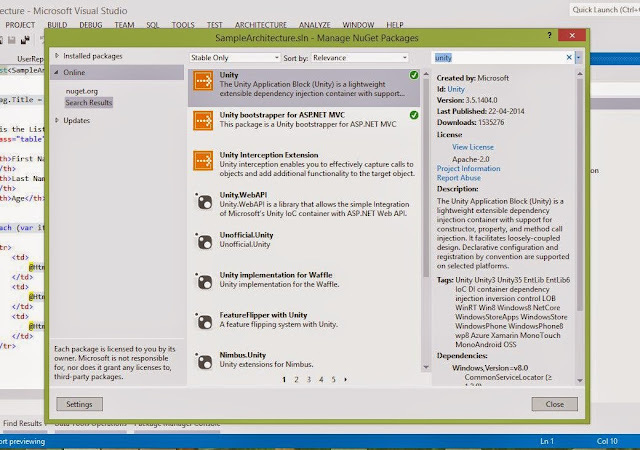 Let's start by adding the reference to the unity dll's. 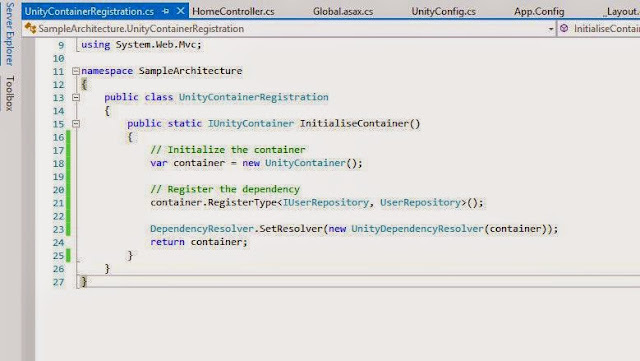 Now the controller needs the instance of the UserRepository, which will be provided by the UnityContainer. As the name suggests, unity container is like a container which is responsible for providing the required dependency to a class. In our example, we need the UserRepository instance. So unity container will provide it, to us. But before it can do that, we need to register the required dependencies with the container. Registering the dependency is like telling the container that when i am using this interface, provide me an instance of the concrete class that implements this interface. At run time, get the required dependency from this container and inject to the required method using the Constructor, Property or Method injection process. So for this, we add a class named UnityConainerRegistration and register the dependencies. 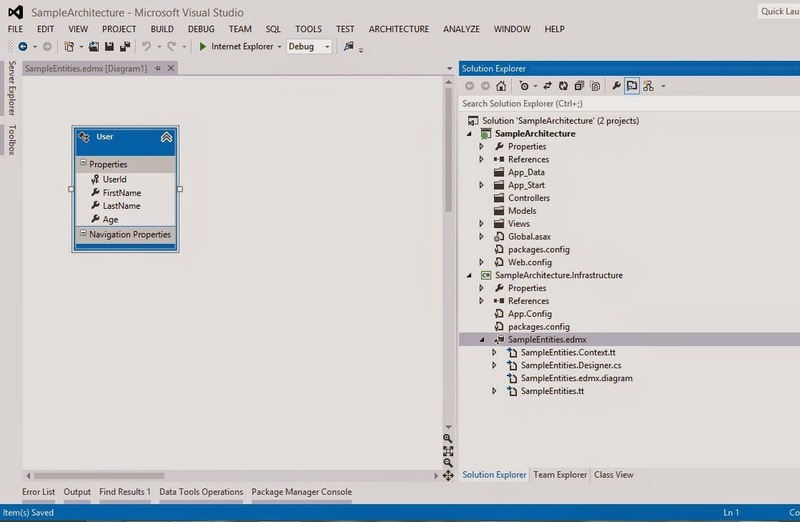 We add this class in the main web project as this is where we need the dependencies to be resolved. Next, we initialize this container in the Global.asax file. So when the application is started, it will register all the dependencies in the container. Finally, we change our Controller to receive the dependency of UserRepository, using the Constructor, in the form of IUserRepository (as it implements this interface). This dependency gets resolved through the unity container we registered above. So this is what we discussed in the starting. Wasn't that easy to learn. Hope you enjoyed reading it. Happy coding...!! !